Heights: 28", 24", and 20"
covered with non-slip synthetic cloth. Size (Dimension): 6'',9",12"18" & 24"
To furnish the diverse requirements of our clients in the best possible manner we are involved in offering an extensive range of Plyometrics Boxes - Model No 703. • Made of 1 inch – 15 gauge welded tubular steel. • Landing surface is 3/4 in. plywood covered with 1/8 inches non-skid rubber slip resistant pad. • Legs are constructed at 6° angle to prevent tipping. 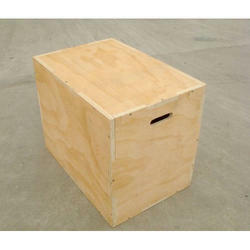 • Plyo box in steel P.U paint (30, 36, 42). - Sizes available - 6", 12", 18", 24", 30", 36", 42"
Packaging Type: Bubble packing wrap. 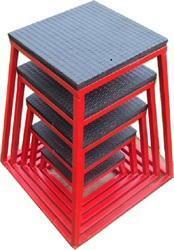 Features: It is made of heavy street with rubber, It uses for physical training fitness, etc. Size : 6, 12, 20, 24.